Gerald, played by Uti Nwachukwu is a philadering commitment shy executive, who is horrified when he is told that his nephew Junior will be left in his custody after his brother’s death. He worries that this development will mark the end of his social life, leaving him subject to a life of PTA meetings and cleaning nose boogers, but there is no choice as the only way out of the arrangement according to the will is if he himself dies. Under his girlfriend Ella’s (Tonto Dikeh) persistence he reluctantly takes the boy into his home, but struggling to bond with the boy hires a nanny to help him out, who is a recently sacked secretary (Uche Jombo) with a huge secret. Her presence causes his girlfriend to feel resentful. This is the first time that I am seen Uti in a film. He is good looking and dresses sharply but his acting doesn’t excite me at all. He is aiiight but just way too hyper and shouts alot. If he toned it down a little, he could actually be good. He did actually improve as the movie went on, hmmmm or did I just get used to him? The other newbie was way more natural (the guy that played his friend) although his performance wasn’t anything you would write and tell your friends about either. Tonto’s acting felt forced, with the more and more common habit she has of stumbling over her words. Back in the day Tonto would KILL every performance. Her performances are hit or miss these days. Uche translated her role well. She never disappoints, so I didn’t expect anything less. Dora’s friend reminded me of Chika Ike her voice sounded that same, just annoying. Tonto looked flawless. The hair was Brazilian but flowing and blended. This must be noted because we all know just how horrific Brazilian hair can look. It seriously looked amazing, as did her make up and her wardrobe. She was dressed to kill. The colours and style were like woah. Uche was definitely not on the same levels although she looked decent. The weave was reddish and a little shabby. I know she can look fab but unfortunately this wasn’t one of those times. The scene where Uti was interviewing nannies was hilarious, particularly the born again Christian and the nose picker. I didn’t understand why Gerald was so upset when the secret was revealed. Say What? Or did he think her affection for him had been faked maybe? The movie was enjoyable to watch and I’d recommend it. Technically the movie was nicely shot. The soundtrack blended easily and the picture and sound were good. I liked the story but I did find it a little predictable. It reminded me of My Soul Mate. Uti was aiiight for a newcomer and Uche Jombo was her usual on point self. Thumbs up! And i so agree with the comment about tonto’s hair, it is always on point. where did you see this movie? or is it another special screening? LOL Chisom! DVD’s are being sent out on Tuesday so anyone can get their hands on it from then. I’m sure you’ll like it. HOW TO BUY THE NEW MOVIES NOW? I have been really impressed of late with the movies I have been seeing from Royal Arts (Kiss & Tell, Spellbound, Holding Hope), I have always loved Uche Jumbo and I think she is getting better in her acting. 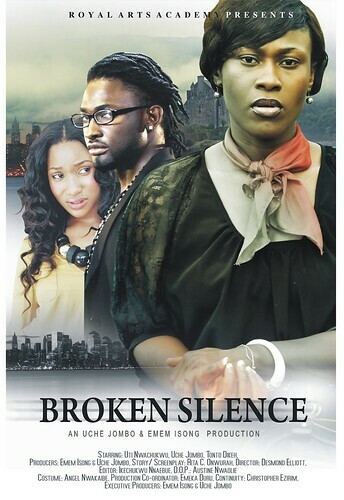 I just saw “Broken Silence” on irokotv.com, and I think it is actually a good movie, the storyline is similar to many other movies, plus I wondered about the shouting young boy, but all in all, it is a good movie. For me Uche has always been great but her full range hasn’t always been allowed to shine. Thanks for commenting. Hope to see you more. c’mon u cannot call this a movie review! i am sorry to say but I don’t think you conveyed any reliable information about the movie other than the obvious. People want to read about the technicality of a movie also. Up your game man.